While some people dread spring-cleaning, we look upon it with delight. 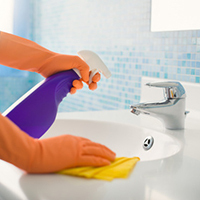 It’s the ideal opportunity to take some time out of your busy life and focus on your home—especially those areas that are often overlooked during your weekly clean. It also is a time to take stock of your clothing, furniture, and possessions and donate or recycle those things that are no longer serving a purpose. Not quite sure where to start? Simply follow our room-by-room Guide to Spring Cleaning. Get fresh in the bedroom! 1. Rotate your mattress. If it is 10 or more years old or the old flip style, consider purchasing a new mattress. 2. 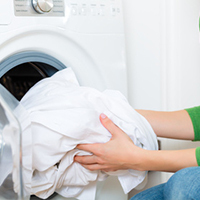 Wash or professionally dry-clean blankets and comforters, as well as mattress pads and bed skirts. 3. Have rugs professionally cleaned or rent a deep cleaner to clean them at home. 4. Clean and organize your dresser drawers. Try on clothes and donate those items that don’t fit or that you no longer wear. 5. Want a new look to match the season? Check out the latest home décor trends and purchase new bed linens for an inexpensive style swap. Clean and organize your bathroom so it becomes a place to wash and go, allowing you to get outside and enjoy the warm spring temps. 1. Sort through your towels and linens. Transfer old, frayed towels to the garage for use in car washing. 2. Clean out the medicine cabinet. Discard old or expired medications and products, following the FDA guide for safe disposal of medicines. Restock your first aid kit and travel products so you’re ready for your next big trip. 3. Go to town on the tile. Scrub the shower, floor, and walls with a mixture of ½ cup ammonia, ½ cup baking soda, and 1 gallon of water. 4. Fix those sink leaks and drips and that running toilet you’ve been trying to ignore. Call in a plumber for the big problems. 5. Wipe down vents and fans with a damp cloth. Clean out light fixtures. In most houses, the kitchen is the command center. A thorough cleaning of this area will have the whole house running smoothly. 1. Move all appliances and vacuum and mop underneath. 2. Clean the oven. Use the self-cleaning mechanism if you have one or mix a paste of baking soda and water. Coat the oven with the paste (avoiding bare metal and heating elements) and let it sit overnight. Scrape it off with a spatula the next morning (be sure to wear rubber gloves). Fill a dishwasher-safe cup with plain vinegar and place it in the top rack. Run the machine through a cycle. Use the hottest setting available. The vinegar will remove grime, clean difficult stains, and sanitize the dishwasher. It will also help eliminate musty odors. After the vinegar rinse, sprinkle baking soda around the bottom of the tub and run another cycle—again, use the hottest water available. The baking soda will brighten your washer and leave it smelling fresh. 4. Brighten up stainless steel appliances and pots and pans by rubbing them with a soft cloth soaked in white vinegar. 5. Go through the pantry and discard any past-date food products. 6. Empty out, then vacuum and wipe down the cupboards. Donate any small appliances and dishware you no longer use. 7. Clean out the refrigerator. Remove all the food. Discard anything that is past its due date. 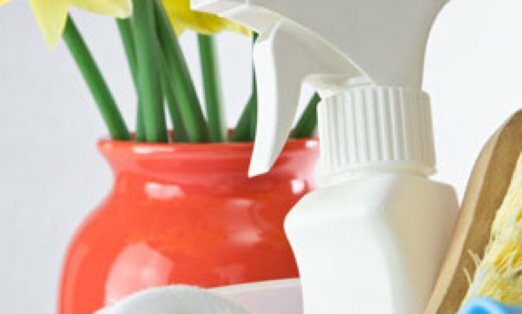 Wipe down shelves and doors with hot water and a mild dishwashing liquid. Prepare for a spring fete with a squeaky-clean living room. 1. Vacuum drapes and window blinds. 2. Wipe down baseboards, doorframes, and walls with a damp cloth. 3. Deep clean or professionally dry-clean rugs. 4. Use leather cleaner on leather furniture and a suede brush on nubuck. Vacuum all furniture cushions and frames. 5. 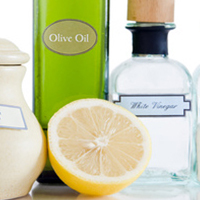 Polish wood furniture with a mixture of ½ tablespoon olive oil plus ½ cup vinegar or lemon juice. Spray on with a spray bottle and gently rub, using a circular motion. 6. Dust all paintings and artwork. Clean glass frames with glass cleaner. Heighten profits with a home office cleanout. 1. Tackle paper. All too often, we let paper pile up. Not only does this create mess, it also puts us in danger of losing important documents. Take a deep breath and dig in. Shred or recycle items you don’t need, and file important documents. Clean out your file cabinet and discard outdated materials. 2. Sort through your office supplies. It’s easy to accumulate stacks of notepads and pens. Filter out those you like best and donate the excess to a local school. 3. 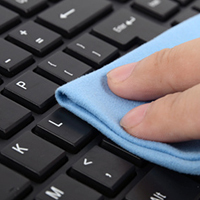 With a damp cloth, dust your printer, fax machine, scanner, and other office equipment. 4. Take stock of your printer ink, paper, and other supplies. Purchase what you may need and organize it neatly in a drawer so you’re never left without important office materials. 5. Clean up your virtual space. Organize files on your computer—delete those that are no longer needed and create folders for like items. Put your mind at ease and purchase a hard-drive backup in the case of a computer crash. 6. Want to create your ultimate workspace? Check out our guide to designing your home office!